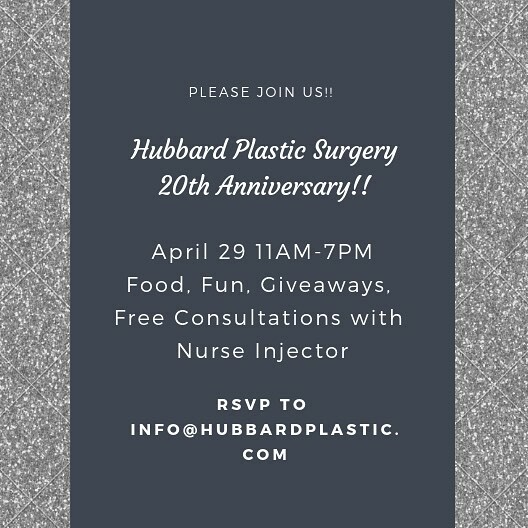 Hubbard Plastic Surgery will be hosting an Open House to celebrate 20 years of being in practice! Door prizes, food, live demonstrations, educational sessions, and special discounts will be available for everyone that attends! Event starts at 11AM and will end at 7PM. We encourage all our skin care patients to register for the Brilliant Distinctions rewards program to begin earning discounts for and on Botox, Juvederm Ultra Plus XC, Juvederm Voluma, Volbella, Latisse, and SkinMedica treatments and purchases at our office. Remember special occasions with a gift certificate to our Skin Enhancement Center! Call (757) 600-6227 to order one today.